Sales are what drive a business. If you are not managing very well in this department in the long term, it’s time to focus almost solely on sales or prepare for an eventual fading out. In the case of declining, low, or nonexistent sales, a mediocre and ineffective sales process is one of the most common culprits. This is not to say that your sales process was bad. However, it does mean that it may simply not applicable anymore. The market changes with the times, as do the needs and wants of your consumer base. When you know you have a viable product and there is demand for it, along with the experience and connections, see if your sales process is viable. No customer is going to lay out their hard-earned money for a product they know nothing about. there’s a reason why many people prefer to stick to brands; they’re familiar, known, and trusted. even if your potential customer needs your product, it is unlikely that they would make a purchase without adequate research. Thus, in order to make sales, a company has to understand the buying process as well. how the customer researches and analyzes a product is instrumental in getting them what they want. Moreover, each customer and groups of customers have their own unique needs, wants, and respective processes. Plus, their purchasing patterns also come into play here. 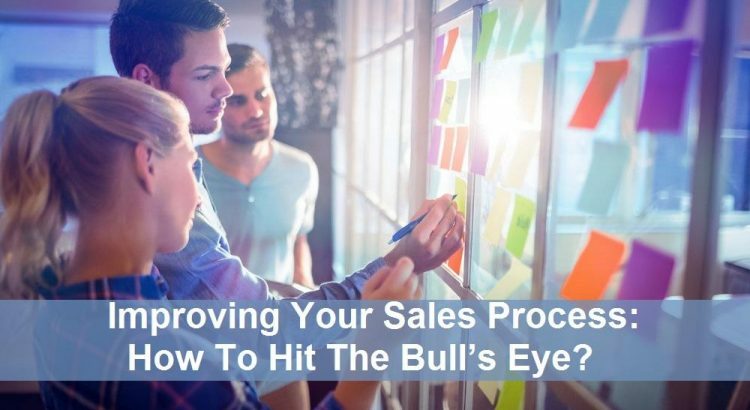 Sales teams need to work according to these processes. One should also look at whether there is a need to educate the market before making sales to them. For instance, before selling solar panels, one should take some time out to prepare a potential customer base who would know about the benefits, maintenance, and logic of having this alternative energy source. When a sales team or their manager knows these factors, they would be better able to gauge their own sales process. At all events, the process should not be so permanent or inflexible that it throws a wrench into the buying process. It is much better to work with the flow and provide the customers with the best product in the most suitable manner. In order for a sales team to perform well, they need to understand why they’re doing things a certain way. If they have a set process, it allows for more security, efficiency, and quality of service. While a certain amount of flexibility is necessary, a sales process must also be consistent. This prevents wastage of efforts and allows everyone to have their own essential roles and responsibilities. A defined sales process may not be that important to a startup; however, this is because a new or small company usually has very limited number of employees. Hence, they can even look at sales as individual cases. However, as a business expands, it would have to take on a somewhat set sales process in order to have a secure base. When the process is running smoothly, the managers and star employees can devote more attention to expanding operations and growing strategies. Sales are going to be few and far apart if your sales team doesn’t have the proper leads. You want to utilize every resource you have, so be sure you know their true and complete value. For instance, if an employee is better suited to a high-level task, don’t leave him in an entry-level position for too long. The same goes for potential customers, whether individual or corporate. Just like there is a filter system for job candidates, there should also be a qualification filter for customer prospects. You need to know how to gauge whether they serious about considering your services or just looking around. Find out their budget, their relevance to your field, and whether they have sent the proper candidate for making the decision. Looking at all these factors would help you to decide how to deal with a potential client. Thus, you could choose a pre-decided plan of action to reel them in or gently fob them off. In order for a sales team to perform at its peak, we must consider the division of labor principle. There is a lot to be done in closing a sale, and each element needs careful attention. Plus, there are so many elements that only a few sales team members can be adept in all of them. It is thus recommended that the responsibilities of each member be allotted to them according to their interests and talents. They would then understand their roles better and be more motivated. At the same time, it is also important to make everyone on the team realize that they are committed to the same goal. Regular meetings and collaboration should help out with this area. Needless to say, once a sales team is motivated and everyone is following their passion, sales are likely to go up. Any salesperson would go the extra mile to talk up the product he is selling if he is satisfied and happy in his job. Automation is the need of the times, no doubt about that. A company may prefer to close sales and earn revenue in a traditional manner, but this would severely limit the sales potential. Customers are becoming more and more attuned to technology, so why not give them the convenience they desire? When a company starts automating its sales process, it can capture the market at a much higher level than otherwise. Online websites can stay open 24/7 with rotating customer support staff. Plus, the ease of dropping items into a virtual shopping cart can lead customers towards making more purchases than ever. At the end of the day, automation just makes the whole process so much smoother. A CRM tool can help with collecting customer data such as their search history and preferences. A company can use this information to close more deals using a sales acceleration softwares. This can greatly help with ensuring growing number of new sales, repeat purchases, customer loyalty, and customer satisfaction. Best of all, automation deals with the monotonous part of the job. This means the sales team is free to practice their skill in the best possible manner. So you’re not only upping customer satisfaction but employee satisfaction too. This again improves performance and leads to increased sales. Establishing an efficient sales process may be difficult, but it is far from impossible. What every member of the sales team needs to do is pool their experiences and make a relevant plan for their company. They can end up cutting a lot of costs and making many more sales this way. The key component in a proper sales process is to make sure nothing of value is being wasted. One should keep working on their sales process in order to update it according to the need of the hour. Jillian Petrova is a Manager at a startup. Being an effective leader, she believes in working with the team and thus produces better results. This is her strategy in both sales and her freelance coursework help team.